This cultivar originated as a seedling selected in 1993 by Randy Dykstra and Chub Harper from seed sourced from the original L. decidua 'Lanark' broom. Chub Harper of Moline, Illinois gave a witch's broom seedling from L decidua 'Lanark' to Dennis Groh of Dearborn Heights, Michigan, saying that he and Randy had too many of these seedlings on hand to "baby sit." 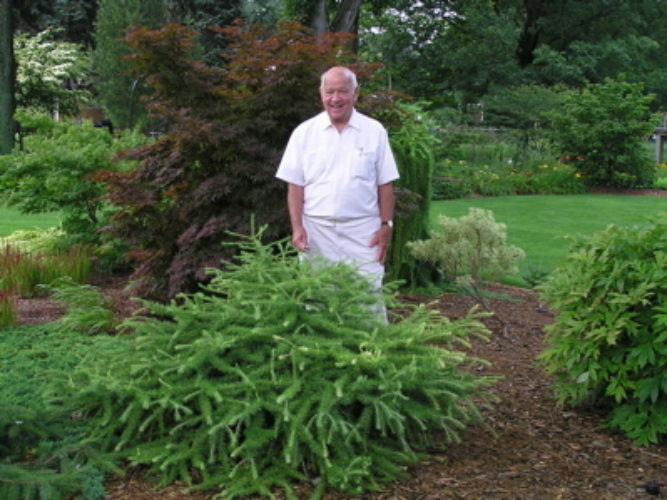 After growing it in his garden for a number of years, Dennis recognized this plant as a superior, very dwarf selection of this species. Over time it has been grafted and these plants have been distributed to other collectors and arboreta. The plant was provisionally named 'Dennis Groh' and can occasionally be found listed under that name. In 2004, Dennis told Chub that he was interested in getting it propagated and worked with him to establish a permanent name. At first Dennis wanted to call it 'Chub's Gift,' but Chub balked at the idea, saying that he already had enough plants named for him. Rather he suggested renaming it, 'Pretty Carole' in honor of Dennis Groh's wife. The plant itself echos its namesake. It makes an excellent small garden plant and one that stays in scale with the surroundings. Many consider 'Pretty Carole' to be among the best of the Lanark seedlings known. 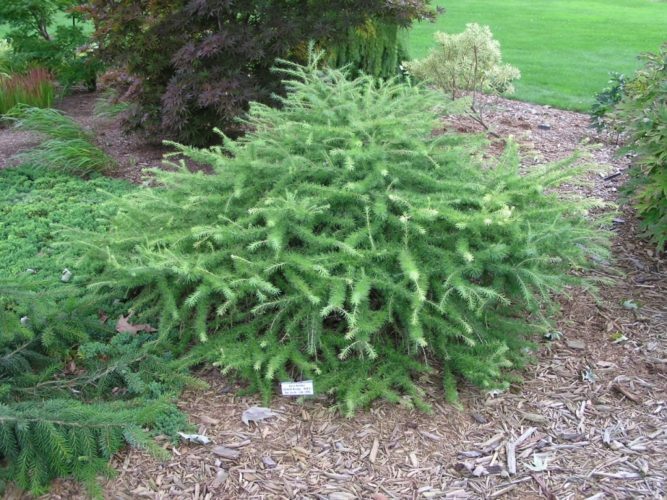 Larix decidua 'Pretty Carole' — this photo shows the original plant growing in Dennis and Carole Groh's garden in Dearborn Heights, Michigan. The plant was 10 years old at the time. Chub Harper is posing with the plant. Larix decidua 'Pretty Carole' — a mature specimen in an arboretum setting. 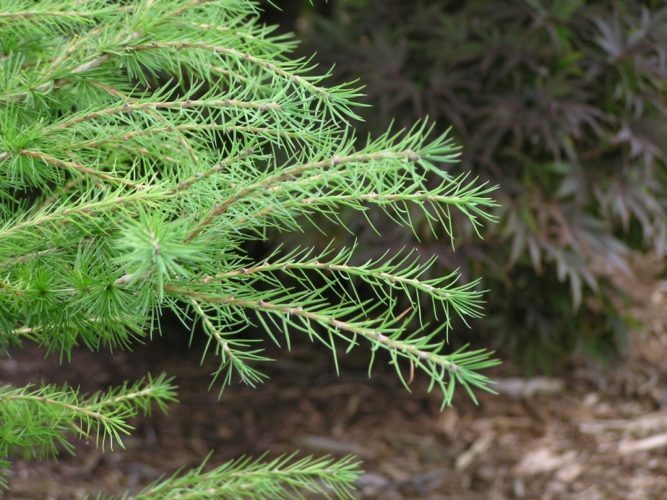 Larix decidua 'Pretty Carole' — a closeup of foliage detail. Hi David, I was asked by Rich Larson to register this plant. So I was doing some due diligence on dates. We selected the name when Chub visited my yard. The date on the picture of Chub in my yard is July 18th 2004. So 2004 is more accurate than the 2006 currently listed on the web page. Thanks, Dennis.